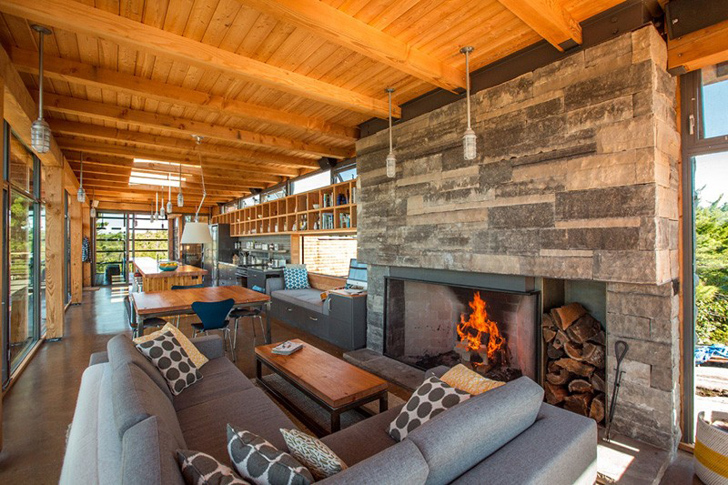 Over the years, cottages have transformed from modest seasonal 'shacks', to modern year-round 'resorts'. But that doesn't mean they can't become one with the land. One project which nestles beautifully into its site is Monument Channel Cottage by Charles Gane of CORE Architects. Completed in 2013, this cottage offers all the amenities for cottage life, plus plenty of rustic style. 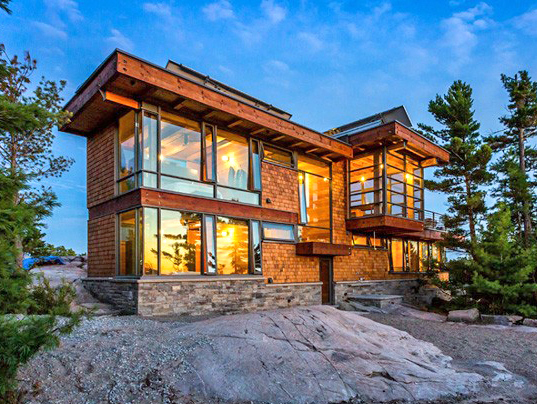 This stunning 2,125 square foot leisure property is located in the Go Home Bay area of Georgian Bay, Ontario. 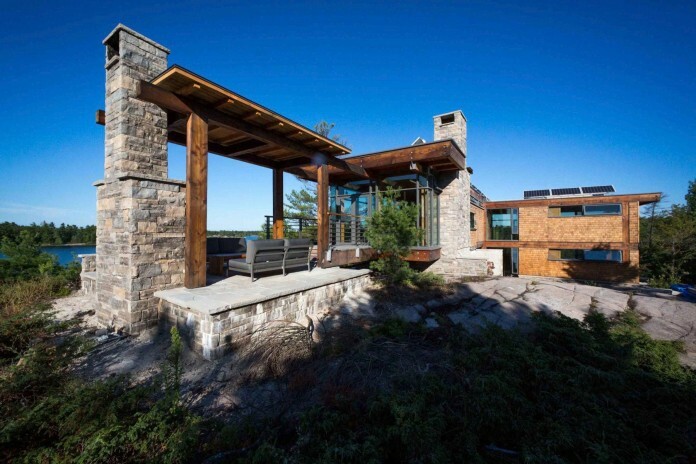 Perched on a rocky outcropping, CORE Architects used wood post and beam construction, wrapping the exterior in stone, wood shingle and expansive rhythms of glass, which frame the captivating vistas. Materials include Douglas fir for the structure, with cedar shingles on the facade and Ipe for the decking for optimal weather resilience. Inside, the wood remains natural, while outside it is oiled to protect it from the environment. The open plan is a series of articulated living spaces wrapped by large glass doors which connect to an expansive outdoor 'room'. 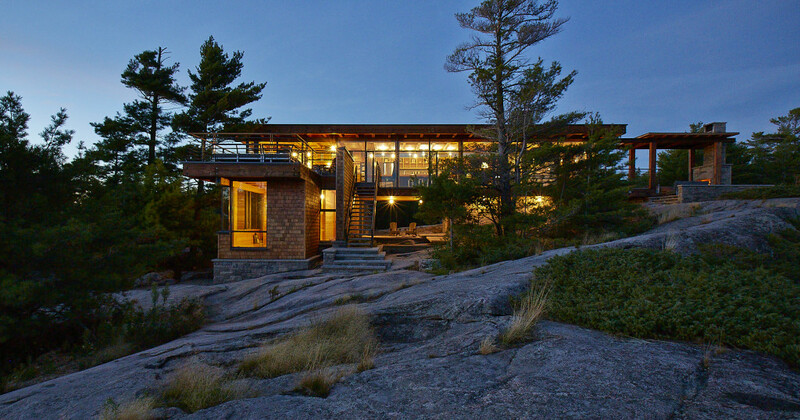 The stone fireplace and concrete floors anchor the structure to its site, firmly rooting it in the cottage vernacular. 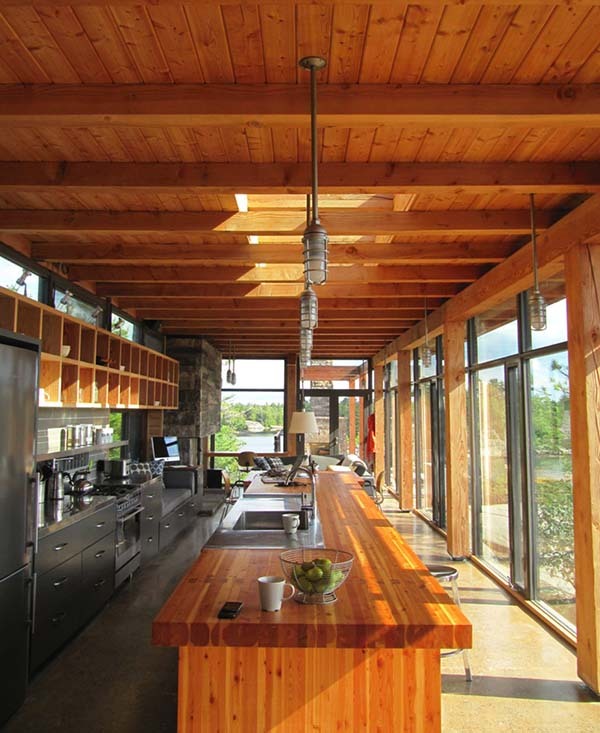 Despite all the modern provisions, this cottage incorporated several sustainable features, including generating electricity through the use of solar panels and treating wastewater with a bio-filter septic system. All in all, this cottage abides by the rules of environmental health while serving as the ideal vacation retreat! Visit CORE Architects to check out their impressive body of work. Photos courtesy of CORE Architects.